Climate change not to blame for 2013 Colorado floods – lack of infrastructure upgrades played a key role | Watts Up With That? DENVER (Oct. 29, 2014) – The severe flooding that devastated a wide swath of Colorado last year might have been less destructive if the bridges, roads and other infrastructure had been upgraded or modernized, according to a new study from the University of Colorado Denver. The stage was set for the deluge when an unusual low pressure system generated a steady plume of monsoonal moisture flow from the Pacific Ocean toward Colorado’s Front Range communities. The rain began on Sept. 9, 2013 and didn’t stop until the 16th. 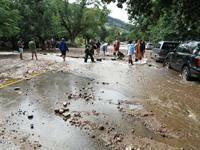 In just days, places like Boulder County received three-quarters of its yearly precipitation. Bridges collapsed, roads failed and homes were swept away. Kim said new `scour control’ methods, aimed at reducing these washouts, should be developed to help bridges withstand future flooding. “The production of such data and maps extended well beyond the typical GIS community and included local news affiliates and even the City of Boulder itself,” said study co-author Wesley Marshall. For example, on September 27, 2013, Boulder launched a ‘Community Flood Assessment’ crowd-sourced map using the Crowdmap application. The city asked users to submit flood reports via the website or smartphone apps. They were also asked how deep the flooding was and if they lost power. Video and photos could be uploaded to locate the event on an interactive map. “Such efforts were not only useful during the recovery efforts but will continue to be used toward helping increase the resiliency of Colorado during such events,” Marshall said. At the same time, the American Society of Civil Engineer’s 2013 Report Card for America’s Infrastructure gave the country a dismal D+. The group said $3.6 trillion was needed by 2020 to address the most serious problems. Last September’s widespread flooding in northeast Colorado, which saw just over 17 inches of rain in one week in the city of Boulder, was not made more likely or more intense by the effects of human-induced climate change, according to a new NOAA-led study published today in the Bulletin of the American Meteorological Society. The Colorado research is part of an international special report on 2013 extreme weather events. NOAA’s media release describing highlights of the full report can be found online. “There’s clear evidence that overall, our greenhouse gas emissions are making the planet warmer and moister, but we found such climate factors had little appreciable effect on the frequency of heavy 5-day rainfall events in this area during September,” said Martin Hoerling, a research meteorologist at NOAA’s Earth System Research Laboratory in Boulder, Colorado, and lead author of the new study, which also included researchers from the Cooperative Institute for Research in Environmental Sciences (CIRES) and NASA. In fact, the study suggests that in this region, the likelihood of heavy rainfall events may have slightly decreased because of human-induced climate change. Last summer’s extreme rainfall—17 inches is close to the city’s typical total for the entire year—was very unusual, but it wasn’t the first time Colorado experienced such heavy rains. Widespread flooding rains fell over the Front Range during several days in September 1938, before human-caused climate change was detectable. The two events were similar in many ways: they happened over a large area, lasted a long time, and were characterized by a slow-moving weather system that pulled lots of moisture into the region. To tease out the impact of climate change on the 2013 floods, Hoerling and his colleagues used a climate model, developed by NASA, that contained detailed information on how various climate factors—such as greenhouse gas levels, ocean temperatures, and sea ice extent—have varied since the late 19th Century. Run many times, the model produced occasional heavy September rain events both at the end of the 19th Century (1870-1900) and in a recent 30-year period (1983-2012). Comparing those two time periods, the researchers found that the extra greenhouse gases, warmer oceans and lower amounts of sea ice of recent decades did not increase the likelihood of rains as heavy as those in September 2013. The researchers also explored what the future may hold for such rain events in this area, as greenhouse gases continue to rise. The team examined climate projections used in the Intergovernmental Panel on Climate Change (IPCC) assessments and found no significant changes in the risk of summer heavy 5-day rainfall events over the High Plains region, including Colorado. Hoerling and colleagues stressed, however, that with further increases in water vapor in a warmer world, many parts of the world are likely to see more frequent episodes of very heavy rains. They said that what happens globally doesn’t necessarily explain what happens in one particular place, where local to regional processes may trump global ones. To figure out why that is, the researchers are doing further studies with other models. If climate change didn’t cause the 2013 floods, then what did? “For this event, the weather pattern was much more important than climate change, or other climate factors such as ocean temperature variations and changes in Arctic sea ice,” Hoerling said. In this case, a slow-moving low pressure system pulled up moisture from the south and essentially stalled at the Front Range, dropping that moisture as heavy rains. Authors of “Northeast Colorado Extreme Rains Interpreted in a Climate Change Context” include Martin Hoerling and Randall Dole from NOAA’s Earth System Research Laboratory; Klaus Wolter, Judith Perlwitz, Xiaowei Quan, Jon Eischeid, and Henry Diaz from CIRES; and Hailan Wang and Siegfried Schubert from NASA’s Goddard Space Flight Center. October 29, 2014 in extreme weather, flooding. I’m puzzled. This article is about flood damage control, not flood control. Does that mean they accept that flooding is not unusual, but flood damage is? If this is the position then there is incompetence involved for building badly conceived infrastructure. If, on the other hand, flooding is deemed unusual and the damage is the result of unusual flooding then they’re going to ask for more money to solve the damage problem and continue the failed climate policies intended to deal with perceived unusual flooding. In fact I think the flooding is not unusual and they want to hide their mistakes by replacing faulty designs while making no change to the AGW driven policies. Why have the lessons taken so long to learn? …Railroad bridges were swept away at Portland, Colo…. Flood Waters Sweep Down On Lowlands In Colorado . 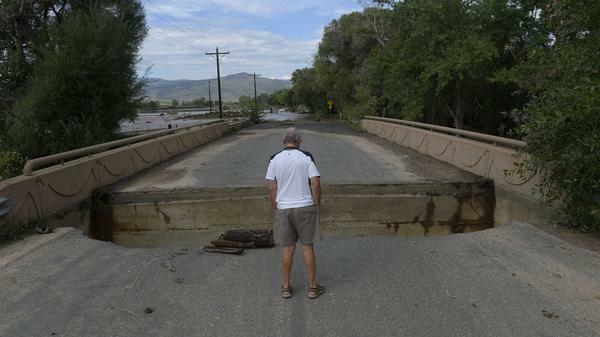 …..Two bridges in South Denver were carried away by the flood waters today…..
…A bridge in Golden was broken and 500 feet of Colorado and Southern railroad track wash-ed out…. 17″ worth of steady rain will flood and damage anything and everything in the mountains. Most every bit of that rain funneled down to just a few canyons and with 9,000 Ft. of elevation change from the top of the front range to the foothills that’s a lot of power. The cost of building flood proof canyon infrastructure would be prohibitive, assuming there is such a thing as flood proof infrastructure in canyons. FYI The bottoms of canyons are where all the roads and bridges, power and phone lines, water and sewer lines go. U won’t bother explaining why. I find it interesting that, at least where I was raised in the North Carolina Blue Ridges, those dumb hillbillies (as we were called) never built their road and houses in the creek bottoms. The first thing I noticed after moving to the mountains of Colorado was that practically all the development in the canyons was in the flood plain. Sure it’s a lot easier and cheaper to build in the creek bottom, but about every 15 to 20 years Mother Nature is going to show you how stupid that was. In 1976, the Big Thompson Canyon flooded in much the same way as it did in September 2013. I had just moved from Greeley to the San Luis Valley and had relatives and friends in the vicinity of the flood. We visited the damaged area shortly after. In the intervening years, particularly after returning to the Front Range 20 years ago, I’ve watched people (re)build structures throughout the canyon and the river flood plain below on the plains. I’ve asked rhetorically why people were building on the flood plain and in the canyon and what will happen when another flood like 1976 occurs. I got my answer, unfortunately. Fortunately the fatality rate was far lower in 2013 (144 vs. 14). Most of the drainage area involved in this flooding was not urban,and not developed. Also the time of concentration for the urban areas is much shorter than the 5 day duration of the precipitation in this case, so it is unlikely that urban development affected the magnitude of the flooding by much. The tendency of drainage ways through urban areas would have restricted the passage of water through those urban areas: that would have increased the level of flooding. True, i read the headline ,CU Denver study says upgrading infrastructure could reduce flood damage, and went off tangent. So this is all water under the bridge? No, some of it is over the bridge. And eventually thru where the bridge used to be…. Warming the global atmosphere does increase the moisture that it holds and does increase heavy downpours and heavy rain events in some places. However, the divergence between global warming and increasing CO2 is making CO2 look less and less of a factor in that warming. If not for the warming in the 1980’s/90’s, there would be no CAGW theory case. After all, there was slight global cooling for 30 years prior to that and almost no global warming after that. How did CO2 know to warm things up for 30 years ~1915 to ~1945, cool things a bit for ~30 years(with some humans alarmed over the cooling), then warm things again, to new highs(so humans could get alarmed over the warming), then stop warming again for well over a decade……while CO2 levels in the atmosphere have soared to new highs. I can see a case(weakening) for some of the warming to come from CO2 but the global CO2 temperature fingerprint is getting harder to make out and the natural cycle fingerprint more obvious. It’s true, at least the temps are. They may be having an issue with color, but the temps and the extent are true. It really is COLD water in the North Pacific & North Atlantic (and Great Lakes for that matter). I thought that barack ebola had us covered with all the stimulus money he confiscated to spend on infrastructure. This event was much larger that the design values for hydraulic structures such as bridges. Even if all the bridges had been replaced recently their capacity would have been exceeded and the structure would have been damaged. The damage may have been less, but it would have occurred. If so then the impossibility of preventing this suggests the entire premise claimed is a lie. Yes BUT I note that there are bridge design methods that can greatly reduce the frequency and severity of flood damage. Characterized by high roadways, long spans with piers designed to minimize scouring they can survive flooding and after resurfacing be pressed back into use in days. This is not exactly new technology, there are over 900 bridges built by the Romans still in use today. A classic example is the Roman Bridge at Vaison-la-Romaine over the river Ouverze which in the almost 2 millennia it has been in use has survived floods that destroyed modern bridges. The devastating flash flood of 1922 raised river levels to 6ft above the bridge. When the waters subsided the only bridge left intact was the old Roman structure. A more recent example is the ‘New’ bridge over the Tamar at Gunnislake in Devon. Built in 1520 it uses an elegant arch design with scour resistant pier cutwaters that extend right up to the parapet level. This has allowed it contnue carrying heavy traffic after almost 500 years of service and has survived several major floods. Also called deferred shovel ready, lack of 24/7 stimulus, and other dope smoker priorities. So if it rains more heavily than you planned for, the drains can’t cope and things get flooded. Our drains can’t cope with the leaves covering them and that is what is causing our recent flooded streets problems here in south west Canada. Yes, but, if we wait (here in SW Canada) for a measly 6,342 years, at the rate the ocean is rising, I’ll have waterfront property in my 5th floor apartment! Wonder what I can sell for! I’ll suffer a few leaves. When will any scientific research show “the impact of human caused climate change”? It is a phrase repeated constantly by alarmists that has never been documented. Any time I read or hear this I understand it as opinion. Can someone please show me proof that CO2 caused by man has any negative effect? Or if that is unobtainable, how about CO2 from all sources? Until then I will continue to believe that CO2 is a follower not a leader, as observation and proxies indicate. I wouldn’t hold your breath for a logical reply. I have taken several GIS courses and performed watershed analysis in those courses. Land use changes (covering up the land with houses, buildings and roads) is what has made flooding worse. When you reduce the amount of ground available to soak up rainfall you increase runoff. More runoff means more flash flooding and heavier floods downstream. Uninformed people, when they see waters rising quicker than they used to blame it on increased rainfall. While that may be true in isolated instances the main cause is increased runoff. It’s George Bush’s fault for the draconian sequester budget cuts no doubt. The problem with this is that water vapor is going down not up and the world is not warming. So they are two for two in this sentence alone. Absolutely true, and also, there is no factual justification in the paper for that statement about more frequent episodes, etc. “In fact, the study suggests that in this region, the likelihood of heavy rainfall events may have slightly decreased because of human-induced climate change.” to quote the report. So obviously the comment is a gratuitous paean to AGW to grease the paper past the AMS and NOAA censors and maintain future employment. Otherwise, a really useful report, for reasons I mentioned here earlier. Most people in power are clueless when it comes to water management. You can only do so much per $. As soon as people start talking about flood mitigations over here it usually demonstrates their lack of knowledge about water. It then becomes a time to panic. With floods there is always a bigger one somewhere in the future, just like bushfires. You have to learn to live with it not fight against it. Water diverted usually causes a problem somewhere else. Where I grew up it is as flat as so the water can only get so high and then it spreads out. But try to explain that to outside controllers. When a flood did occur they got it wrong. Dangerously wrong! I would imagine it is the same thing in the mountain country of the Colorado. You start thinking how you can control the water, just like controlling Climate, you are walking into a minefield. I know the guys who did the report, and appreciate that they sought a realistic answer to the flood – AGW question. We all know many others in the climate industry who would have sought an AGW cause, and, of course found one. However, they really didn’t need to invoke a NASA climate model, which says more about the virtual climate than the real one. All one has to do is look at the historical record of Front Range deluges and floods, from Raton to Virginia Dale. I live in Coal Creek Canyon, and am the co-op observer here. The old residents, Weather Bureau flood reports, and a book by a local historian report floods similar to September 2013 happening in May 1969, September 1938, and May 1894. Four times in 120 years, or about 40 years apart, on average. The 44-year gap between 1969 and 2013, and between 1894 and 1938, tells me the frequency isn’t changing – or, at least – no one can say that it IS changing. Then there’s the epic June 1965 floods just south of here, and July 1976 just north (Big Thompson). And the Eden flood disaster near Pueblo in 1904. Up here in the hills there’s the near miss of 2003, when nine inches of precipitation fell as snow and took a month to run off (or soak in). Perhaps with Global Warming it would have been rain. 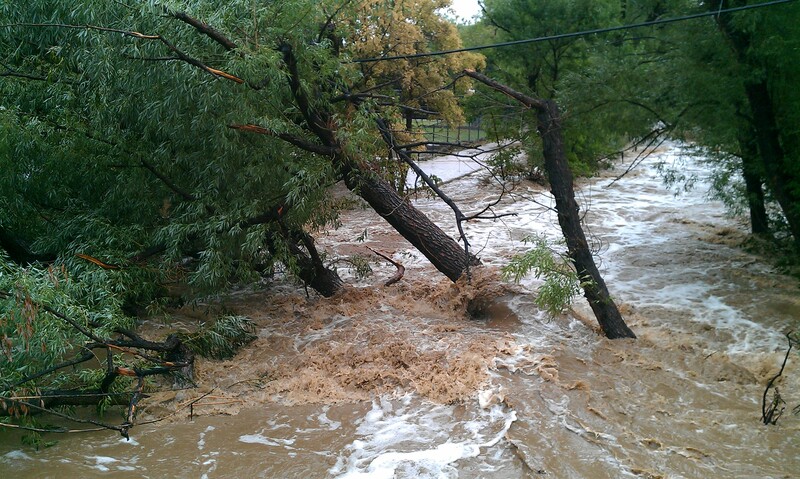 The existence of the 2000-foot deep Canyon I live near tells me these floods have been happening for a long, long time. This report, “Northeast Colorado Extreme Rains Interpreted in a Climate Change Context”, is valuable because it quantifies the obvious. In that sense, it counters those who make their living quantifying the non-obvious (i.e., non-existent). No full names here, but key words would be Al, Jim, National Climate, Union of Concerned, Intergovernmental, Mikey, Gavin, Kevin – you all know these guys. Shortly after the floods, the State Meteorologist stated this kind of flooding in Colorado isn’t so unusual. Historically speaking, several of the areas with abnormally high rain fall, saw similar events every 10 – 15 years. This particular rain fall even ended a 40 year stall/drought on unusual rain/flood events. Normally though, such a large area isn’t affected at once. I’m surprised this person kept their job since, not once did he mention Al Gore’s Warming. While the following is true – Warming the global atmosphere does increase the moisture that it holds and does increase heavy downpours and heavy rain events in some places. It is only true to a point. For example, Death Valley has recorded the highest temp ever recorded with rain fall occurring. Even then, it was only a trace of precipitation which made it to the ground. Not that I have the time to do a study or research it, but I would expect someone would see rain fall amounts vary with temperatures and there is a point of diminished return as the temperature rises. Preferably as a function of % humidity. I would expect we see most thunderstorms when the day time temps are between 75 & 90, but almost none above a temp of 90. The point being, the temps can only raise so much before bad/severe weather can’t happen because of limiting factors. During this rain event and living in one of many flooded areas, I don’t recall the ambient being much above 70. It may not have even gotten as warm as 70. The point I want to make is, had the day time temps been higher, I doubt the flooding would have been worse. Well, some places, but certainly not everywhere. I have a map of “Season with the greatest percentage of annual precipitation” across western North America (sorry, I don’t know how to place it in this message), and depending where you are, the wet season could be summer, fall, winter, or spring, even though everywhere summer is the warmest season. I was a met observer in Panama, and the wettest months were the coolest and the dry season was hot. The highest dew points in the world are measured in the nearly rainless Persian Gulf, and Mt. Fairweather, Alaska, gets over 400 inches of precipitation a year, as does Mt. Waialeale, Kauai, Hawaii. And Hawaii is much warmer than Alaska, but no more rain. During the great Northeast Drought of the early 1960s, average dewpoints in Philadelphia were no lower than during wet years, even though rainfall was just over half of normal (I happened to look into this). And on and on, there’s many cases where higher temperatures, and even more moisture content to the air, does not mean more rain. The reason is simple: precipitation is the product of moisture content and vertical motion, the latter requiring some synoptic, orographic, or convective dynamics. In other words, to make rain you need not just moisture, but a storm – a mechanism – to get that moisture to become rain and fall to the ground. Although a warmer world, if it ever occurs, could mean more H2O molecules in the air, the reduced temperature gradients from equator to pole might reduce the intensity of storms (driven by thermal gradients), and the resulting precipitation could go either way. The same is true with the equally likely scenario of a cooler world, which has happened about half the time since we had an atmosphere. Back in the ocean from where most water vapor comes from. But then – what about missing condensation / cristallization seeds for building precipitation – plain ‘raindrops’. I read moisture gets summed up in an undisturbed, ‘stable’ atmosphere to a point of no return – the catastrastrophic turn. Remember the latest big hail events? Years ago. As you note todays precipitation events depend on disturbed atmosphere, pneumatic forcing, not on the sheer mass / weight of seed accumulated raindrops. By the way – accumulation is never mentioned when talking of ‘climate modelling’. Yes exactly. One of the major flaws in models there is no considereration of thresholds. Thresholds are where behaviour suddenly changes from previous trends and occur in all systems whether mechanical or ecological. A car engine with poor cooling will run continually hotter until it seizes and heating halts and cooling begins. A model not knowing what the threshold for a particular overheated engine to stop running will forecast that the engine will get hot to the point of becoming molten. We know that an engine head may warp of plastic components may fail stopping the engine before going molten, but again if the model does not know this, it has to predict the engine turns molten. We do not know what the thresholds are for the various levers in the climate. We may have reached the threshold for CO2 where its effect as a green house gas flattens regardless of futere CO2 growth. Who knows? And that is the point no one knows, especially the ones claiming to know. Of COURSE global warming played a major part in the Colorado flood damage – just like it played a major part in the British Somerset flood disaster. The reason the floods were so bad was that the authorities had spent all their money on climate conferences and drought protection, and had no money left for floods. See? Global warming is to blame yet again…!! Did you ever try to warn people of the danger ? How exactly did you control the floods ? I am a Geotechnical Engineer, lived in Colorado all my life, I deal with foundations and protection from flooding. I was raised & trained by a Geotechnical & Surface Hydraulics Engineer in Colorado Springs. I have seen and researched quite a bit in this realm. vernespunky quote “sometimes it rains a lot and no one is at fault” sounds realistic & does not deserve the ‘Nice snarky comment’ portion of the comment of u.k.(us). The lack of maintenance & upgrading of bridges and roadways is an enormous problem. Relocating these features to ‘flood proof zones’ is a nice talking point but not economically feasible in when most were originally located in poor locations. We can upgrade infrastructures as long as the US dollar remains the world’s reserve currency, if it gets seriously challenged not so much. Some folks are simply bored. They need something to fight about, something to complain about, something to cry about. Without it, they feel like they will cease to exist. Much of the chaos of our culture boils down to this. Your comment is not only sarcastic but ridiculous. Following the crash of an airliner in a populated area causing death and destruction of infrastructure. If I said I am a structural engineer of 30 years experience it is not possible to design to prevent the devastation caused. Would you make the ridiculous statement why didn’t you warn people? Many older structures, I am not sure about Colorado, were designed by empirical rules and experience. With these structures especially and to a lesser extent for modern designed structures, regular inspection, maintenance and upgrading are essential. Even then with extreme events failures will occur. People are responsible for choosing to live where they do. Many of them choose to live on a flood plain and don’t look into the danger, nor do they buy insurance. That isn’t on flood control engineers or anyone else. THEY dropped the ball themselves. had so little to add. vernespunky was simply giving the conclusion without the detail. Yes, he could have given a lot more detail, but it was a choice he made to give just the conclusion. I’ll provide a little more detail, though I don’t know what Colorado does with regard to flooding, or providing flood information to the public. Large floods like this can’t be mitigated in any way short of a large dam. All new infrastructures are designed with a flood frequency in mind. This is a compromise between the cost of the structure and the number of times it will be flooded. This also assumes that flooding won’t damage the structure. You don’t want damage to the structure no matter how much water or debris goes over it, and design must take blockage and debris into account. Older structures are more often than not, under-designed and under-sized. That damage should happen to these structures would surprise no one in the Colorado government. It simply comes down to money and the priority of its expenditure. And it really didn’t need a scientific study done to state the obvious. Though in my mind, their nonsense about Climate Change at the end almost invalidates everything they say (except what they say is so obvious). Instead of pursuing fantasy policies that we can control the climate by using more solar panels, windmills, and creating idiotic carbon markets, finding realistic ways to deal with severe weather (which has only been around since the dawn of the planet) might be a better way to go. Would some well placed dams help? When was the last time a substantial dam was built in the USA? Hey, you get flood control and electricity, not to mention extra water. Not likely for an event of this magnitude. A dam typically can retain a volume equivalent to 1 or at most 2 inches of runoff from its watershed. This event, 17 inches, would have overwhelmed the dams very quickly and the water would have flowed over the emergency spillway unregulated. Olympus Dam (which forms Lake Estes in my hometown) absorbed the runoff from the prior week and was at capacity when the first or the 3 major downpours occurred. The Corps of Engineers had the flood gates opened to prevent damage to the dam and sent 9,000 CFM down a canyon that nominally carries 1800 CFM during peak runoff in the spring. Just southwest of Estes, 3 reservoirs failed in a domino succession and caused a LOT of damage to the town that was a regular football rival. Further south still, another dam failed. There were well placed dams that had until this catastrophic event prevented floods at the 100 year level for decades. Having grown up in that area I can tell you the biggest problem had nothing to do with the infrastructure but in the fact they had rainfall near the annual average on 3 consecutive nights after 10 straight days of rain at about half that rate. During the first week and a half of rain, the reservoirs were full to the point that the Corps of Engineers were worried about dam integrity and opened the flood gates of several of them. Disappointing to see no mention of that people have been and continue to build in on flood plains. The entirety of the Big Thompson Canyon was flooded by a 20 foot wall of water in the 1970s and it happened again last year. What did they do both times? Rebuild the highway and rebuild the homes. These people are asking for trouble, and they don’t listen. Unfortunately a number of early Colorado settlements were built in very dangerous areas per flooding. Downtown Denver is no longer a severe risk as we constructed 2 large retention dams after the massive 1965 flood, but places like Boulder, Estes Park, etc., are all flood prone and vulnerable. You can either rebuild failed 100 year flood dams or you can build something even larger. Either way, the basic problem is where people are building and living, and as long as people live and work in these areas, there are going to be flooding problems like this. Even more key was the role played by (1) huge amounts of water trying to come down narrow canyons all at the same time (2) people like to live near water and (3) Because of the geography of the front range, a lot of smaller towns grew up near natural cuts in the hogback and the foothills. Those were the routes into the Rockies. Water made those cuts. I’m not sure that spending a bunch of money guarding against 1,000 year flooding is worthwhile. If FEMA would stop acting as insurer of last resort and if the market were free to price risk, people would move out of high risk areas over time all on their own.